Most of us have experienced intense hungers and sugar cravings that we just can’t overcome. We’ve all heard people tell us to “have some self-control” or “just don’t eat it”. We all know the feeling when the cravings take over. We eat that extra cookie despite knowing we shouldn’t. You have been told it’s your fault and your lack of will power over and over again, but it is not your fault. Our inability to stand up to sugar cravings and hungers is not because we’re not trying hard enough. It’s not because we don’t want it badly enough. It is because sugar and carbohydrates produce a hormonal and neurological response that our bodies are not equipped to overcome. When humans eat sugar, the pleasure centers in the brain are activated. The brain begins to produce a dopamine, serotonin, and norepinephrine response that is highly addictive. 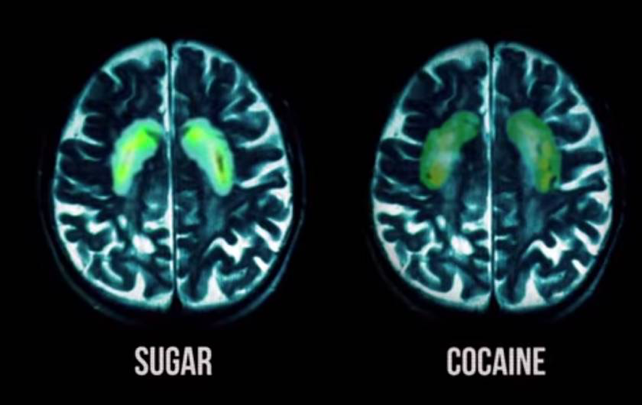 Studies show that the brain’s reward pathways from sugar can be even more rewarding than that of addictive drugs, like cocaine! It is no wonder that so many people crave sugar in emotional or stressful situations, and more importantly, it is not your fault! Sugar produces a neurological, hormonal response in the reward pathways. The good news is, if you address your diet the right way, you can stop your hungers and cravings for good! The Awaken180° Weightloss program focuses on targeting the sugar addiction pathways and helps you eliminated your cravings through the methods below in just a few short days. Minimize sugars and carbohydrates. Carbohydrates and starches break down into sugar in your body, so sometimes simply cutting added sugars will not be enough! Using our Awaken180° products for breakfast or snacks is an easy way to find low-carb solutions throughout the day. Substituting starchy foods, like bread, pasta, and potatoes for lower carb options like cauliflower and zucchini can also prevent the addictive response that you experience with higher carbohydrate alternatives. Increase healthy fats. You may find that when you decrease your carbohydrates, you are not feeling full and satisfied. Try replenishing those calories with healthy fats like Extra Virgin Olive Oil or Grass-Fed Butter. Remarkably, when you’re minimizing your sugars and carbohydrates, these healthy fats promote weight loss and trigger your brain to feel full and satiated. Engage in focused meditation. Using guided imagery and creative visualization can re-pattern and refocus how you think and feel about food and diet. Listening to our Awaken180° Mastery Technology weekly can help change old habits and patterns effortlessly, helping you turn towards other solutions when you experience emotional or stressful triggers in your life.